The Focus Multiplier effect works with the Focus effect. This module applies a blur to the selected layer, based on the blur radius in the Focus module. 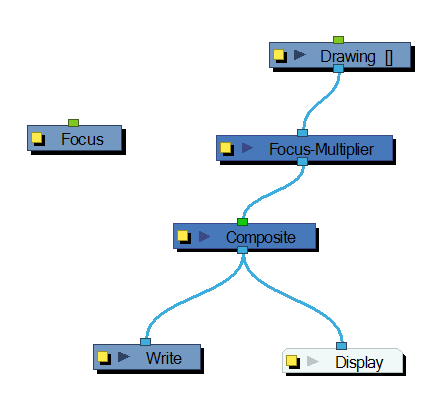 Use the Focus Multiplier module when you want to apply the focus to selected elements or when you need to apply the focus before doing more effects in a composite operation. You must disable the Apply Focus option in the Composite module in order to apply the focus effect to the selected module only. If you do not disable that option, the focus effect will be calculated twice on the selected module. 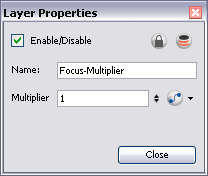 Use the Focus Multiplier editor to multiply the Focus Radius by a selected value. You can enter a static value in the Multiplier field or attach it to a function curve.